Here, no day has an equal on the Left Banck of the Guadiana. Not even the sunny Summer afternoon’s monochordic silence repeats itself on the locust sang; not even the affable brown clays from Serpa and Moura are taken for one another, in the sweet Autumn mornings. How different the gestures of men and women olive picking from the rush on the golden vineyards. And the Spring’s Sun is so different. As in a watercolour, it composes the wavy and flowered dress of the Barrancos fields and the misty mornings, which enchant the Adiça and Ficalho mountain ridges. This is Margem Esquerda. Of the Guadiana River. Different everyday. Different everywhere. Of different chants. Of different gestures. How easily we distinguish the Barrancos fanciful way of speaking from the measured voice, almost carrying the land weight, from a Mértola inlander. This wilderness with so many names and voices, where every poet using exquisite prosody, as big as the world, makes is work, everyday a masterpiece, forever men’s memory and endless looks. Everyday fragile, but not ephemeral. 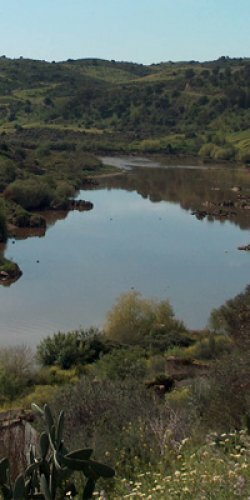 Margem Esquerda do Guadiana. The River. This river that made, and still does, a colourful stained glass window with the people and the fields, of so many shapes, and enchantments, and bush covered hills and wheat plains. In Margem Esquerda do Guadiana the river has the size of a many thousand years memory, brought by people carrying the wide vision of what the land’s simplicity is. And of time.